Join artist Baden Pailthorpe for a roundtable discussion with Adam Goodes, Louise Stephenson, Professor Kim Vincs and Professor Aaron Coutts as they discuss the relationships between competitive sport and creativity, contributing to a conversation around power and the risks and rewards of living and working in the Big Data age. The panel will be led by Deb Verhoeven, Associate Dean of Engagement and Innovation, UTS, who will use Baden Pailthorpe’s exhibition Clanger at UTS Gallery as a prompt for conversation. Clanger explores the aesthetics of power through data, bodies and technology. 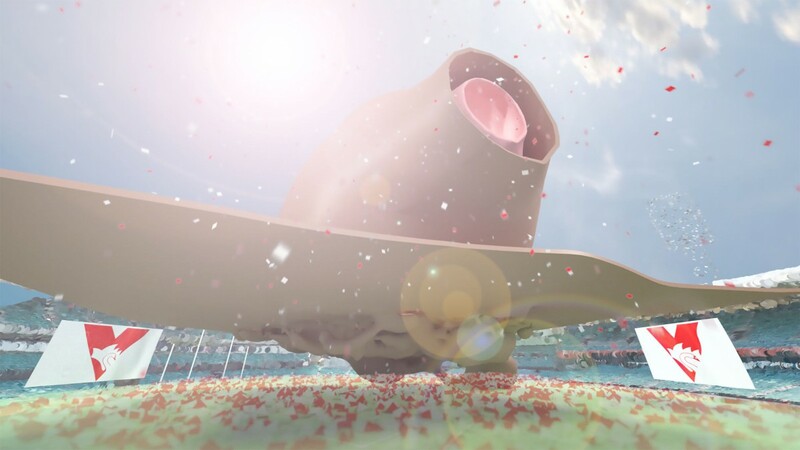 In an environment that is both physical and virtual, Clanger pairs the statistical tracking of AFL player performance with the emotional intensities of the crowd. Using anonymous player and crowd data captured during the 2017 AFL Round 23 Swans v Carlton game, Clanger re-stages the drama and flow of a match in its entirety. Pailthorpe moves the game from the field to the virtual plane, presenting both players and the crowd as data-borne avatars caught in a deeply emotional, cultural and aesthetic tradition. Baden Pailthorpe is part of a generation of artists whose practice is shaped by Internet culture. He is currently Postdoctoral Fellow at UNSW Art & Design. Much of Baden Pailthorpe’s work consists of hyper-real animations, video and sculpture that engage with the spatiality of power, politics and the cultures of late-capitalism. In 2013, Baden was invited to be the inaugural artist in residence at the Australian War Memorial. Significant exhibitions include the 21st Triennale di Milano, Milan (2016); Newcastle Art Gallery, Newcastle (2015); Casula Powerhouse, Sydney (2015); Artspace, Sydney (2014) & CACSA, Adelaide (2015); Centre Pompidou, Paris (2014); Westspace (2014); La Gaîté Lyrique, Paris (2013); and Palais de Tokyo, Paris (2012). Baden’s work is held in major private and public collections, including Artbank, Australia; Australian Parliament House Art Collection, Canberra; Newcastle Art Gallery, Newcastle; The Art Gallery of South Australia, Adelaide; The Australian War Memorial, Canberra; The Netherlands Media Art Institute (NIMk), Amsterdam; The National Library of Australia, Canberra;UQ Art Museum, Brisbane & UTS Art Gallery, Sydney. Louise Stephenson is an Australian rules footballer playing for the Greater Western Sydney Giants in the AFL Women’s competition. Kim Vincs is Professor of Interactive Media at Swinburne University of Technology. Professor Vincs is a leading researcher in the creative arts whose research addresses the intersections of art, movement, performance and technology. She integrates scientific, technological and artistic methodologies to deliver innovative research to digital and performing arts industries, companies and communities. Her work spans creative technology for performance, digital scenography, and VR, AR and robotics applications for motion capture technology. She has been a choreographer for over twenty years, and has created 21 digital technology artworks over the last ten years, in premiere contexts such as the Melbourne Festival and White Night Melbourne. Vincs is also an award-winning educator with expertise in collaborative, interdisciplinary curriculum design that links art, technology, science and humanities disciplines and perspectives. Aaron Coutts is a Distinguished Professor in Sport and Exercise Science at the University of Technology Sydney (UTS) where he is the director of Human Performance Research Centre. Aaron has published more than 200 peer reviewed papers mostly focused around developing evidence-based methods for improving performance and health of athletes. He has more than 20 years experience work in high performance sport often consults to leading sporting organisations. Aaron is also a Director of Exercise and Sport Science Australia (ESSA) and a member of the Nike Sport Research Laboratory Advisory Board. He is an Associate Editor for the International Journal of Sports Physiology and Performance and Science and Medicine in Football. He is also an accredited sport scientist with the ESSA. Deb Verhoeven is Associate Dean of Engagement and Innovation at the University of Technology Sydney. Before this she was Professor of Media and Communication at Deakin University. Until 2011 she held the role of director of the AFI Research Collection at RMIT. A writer, broadcaster, film critic and commentator, Verhoeven is the author of more than 100 journal articles and book chapters. Her most recent book is Jane Campion published in 2009 by Routledge, a detailed case study of the commercial and cultural role of the auteur in the contemporary film industry. Verhoeven is a leading proponent of the digital humanities in Australia. Her recent research has addressed the vast amounts of newly available ‘cultural data’ that has enabled unprecedented computational analysis in the humanities. In addition to scholarly publications and media appearances, she has focused on the development of online research resources such as the Cinema and Audiences Research Project (CAARP) database, an ongoing exploration of big cultural data (kinomatics) and The Ultimate Gig Guide (TUGG) an online archive of live music information.